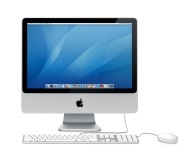 alaTest heeft 174 reviews verzameld en geanalyseerd voor Apple iMac 20-inch, early 2008 (MB323, MB324). De gemiddelde beoordeling voor dit product is 4.5/5, vergeleken met een gemiddelde beoordeling van 4.2/5 voor andere Desktop Computers. Gebruikers waarderen het gebruiksgemak zeer. We hebben de consumenten- en expertbeoordelingen, de leeftijd van het product en andere factoren geanalyseerd. Vergeleken met andere Desktop Computers krijgt de Apple iMac 20-inch, early 2008 (MB323, MB324) een alaScore™ van 94/100 = Uitstekend. Supersleek all-in-one system offers great image quality. As appealing as the new iMac is, with the Leopard operating system coming this month, I'd recommend holding off. If you do, you'll get the new OS preinstalled. The iMac Pro is everything we thought it would be -- good and bad. The 27-inch iMac gets a stunning new screen for photo and video pros, but few other changes. The new 27-inch Apple iMac adds a stunning 5K display for not much more than last year's high-end model. The design, while not updated, remains the gold standard for all-in-one desktops. Except for the new screen and a different GPU, the components are essentially unchanged from last year's version. The high starting price only gets you a mid-level Core i5 processor. Apple skips 4K and goes directly to what the company calls a 5K display in this expensive, extravagant all-in-one iMac desktop that will appeal to photo and video professionals -- or anyone else looking for the best possible screen resolution. The new iMac looks the same, but adds Intel's Haswell chips, plus 802.11ac wireless, faster SSDs, and new Nvidia GPUs. With the addition of Intel's Haswell chips, plus 802.11ac wireless, faster SSD hard drives, and new Nvidia GPUs, the latest ; is a thoroughly up-to-date desktop. Other big-screen all-in-one systems have handy extras missing here, such as touch screens and HDMI inputs. Anyone who bought last year's redesigned iMac doesn't need to upgrade, but for owners of older models or anyone looking to switch, the latest 27-inch Apple iMac offers a wide-ranging set of internal upgrades. Windows vendors are good at cramming in features at low cost, a competitive reality that makes the 21.5-inch iMac look too expensive. Apple's attention to detail extends to the 21.5-inch version of its thin-looking ; . Windows-based all-in-one PCs offer tough hardware competition in the sub-$1,400 price range. The 21.5-inch iMac will be a compelling lower-cost all-in-one for Mac loyalists, but you can get more capabilities from similarly priced Windows all-in-ones. As the most-affordable iMac, the ; offers competitive speed, the unique potential of its Thunderbolt port, and Apple's trademark design leadership. The 21.5-inch iMac isn't the best all-in-one for home entertainment, and its performance competitiveness suffers without an option for more video memory. Apple's $1,199 iMac doesn't offer the same home entertainment features as Windows-based all-in-ones, but its speed, looks, and the future utility of its Thunderbolt port make it a strong choice for performance-sensitive professionals. Largest display among all-in-one desktops; best-in-class productivity and gaming performance; DisplayPort provides home entertainment flexibility; SDXC card slot supports cards up to 2TB in size. Connecting external video devices requires an extra, expensive adapter because it lacks an HDMI port; no Blu-ray drive; runs hot. Best-in-class design; competitive performance in its price range, especially for multitasking; capable mainstream gaming performance. Windows all-in-one vendors offer 20-inch or larger all-in-ones for less; not as well-suited as a dedicated digital entertainment system as some other all-in-ones. Attractive all-in-one design; vivid wide-screen display; great software bundle for home users. Little room for expansion; so-so service and support. The iMac's 20-inch display makes both work and play a lot easier on the eyes, if not on the wallet.